I know we're overdue for a makeup thread — and I promise I'll do one soon! — but I wanted to do a Fat Fashion thread today in order to let y'all know that Simply Be is having a sitewide Buy 2 Get 2 Free sale. That's a pretty darn good deal! 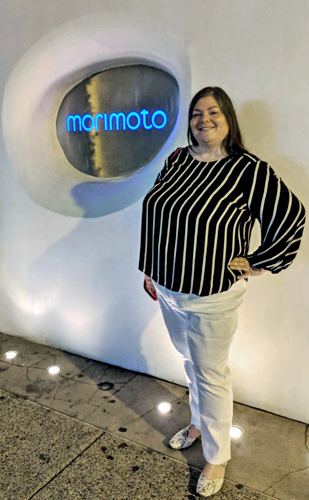 In other news, Iain took me to Morimoto for my birthday, and I felt very stylish in my white jeans from Woman Within, and my Mixed Stripe Fluid Blouse from Loft (whose new plus collection is terrific). I was also carrying a salmon-colored bag, of which you can just see a peek on my shoulder and behind my right hand. Was really happy to find these pieces, the blouse in particular, as I don't want anything with a bell sleeve, a ruffled yoke, or a "cold shoulder" (which I was rocking three years ago, thank you). I have nothing against bell sleeves; my arms are just too short for them to work most of the time. I have nothing against ruffled yokes, either; my shoulders are just quite wide already and I don't love the look of accentuating them. Between these current trends and the abundance of long tunics, which turn into dresses on my 5'2" frame, it's a good day when I can find a blouse that works this well for me, billowy sleeves and all. Also, I'm wild for stripes right now, so that was a bonus!